Clinton and Sanders stretched the facts on the auto bailout, fracking, trade deals and more. Sanders said he doesn’t support fracking because scientists tell him it’s “doing terrible things to water systems all over this country.” The EPA says fracking hasn’t led to “widespread, systemic impacts” on drinking water. Sanders promised that the U.S. would no longer have the world’s largest prison population by the end of his first term. We can’t predict the future, but that would require a reduction of 500,000 inmates in four years. The Democratic presidential candidates met in Flint, Michigan, for the March 6 debate, hosted by CNN. Clinton accused Sanders of being “against the auto bailout” in 2009. That’s a stretch. Clinton: He was against the auto bailout. In January of 2009, President-elect Obama asked everybody in the Congress to vote for the bailout. … I voted to save the auto industry. He voted against the money that ended up saving the auto industry. I think that is a pretty big difference. In fact, Sanders voiced support for a $15 billion package of aid to the auto industry after it passed the House Dec. 10, 2008, in the final days of the Bush administration. The measure was supported by President-elect Obama and an overwhelming majority of House Democrats, but died in the Senate when it failed to reach the floor for a vote. After the Senate failed to act, President Bush decided to help automakers by tapping the Wall Street bailout package that Sanders had opposed and then Sen. Clinton had supported on Oct. 1, 2008. Specifically, Bush agreed to provide $13.4 billion to GM and Chrysler in Troubled Assets Relief Program funds, as explained in a January 2009 report by the Congressional Research Service. Clinton referred to a bill that came up in January 2009, but that measure was mostly about bailing out failing financial institutions and reducing home foreclosures, not about saving the auto industry, as Clinton claimed. The Senate vote on Jan. 15, 2009, was on a measure that would have blocked the Treasury Department from gaining access to the second half of a $700 billion Wall Street bailout package. President-elect Obama urged Senate Democrats to allow the release of the second $350 billion — which included an additional $4 billion already promised to automakers by Bush. But Obama made no mention at the time of using TARP to provide any more money for the automakers. It’s true as Clinton said that she voted to release the money, and Sanders voted to block it. And ultimately, the Obama administration disbursed nearly $80 billion to General Motors, Chrysler Corp. and others in the auto industry (all but $9.3 billion of which was eventually paid back). But at the time of the vote, it was by no means clear that Obama would use more than one-fifth of the $350 billion for an auto bailout. And most of the money still went for the bank bailouts that Sanders opposed. So Clinton’s claim that her Jan. 15, 2009, vote was “to save the auto industry” is — to be charitable — quite a stretch. As SciCheck has written previously, scientists at the EPA would disagree. The EPA’s June 2015 report states that the number of cases of contamination was small compared with the number of wells across the country. EPA, June 4: We did not find evidence that these mechanisms have led to widespread, systemic impacts on drinking water resources in the United States. Of the potential mechanisms identified in this report, we found specific instances where one or more mechanisms led to impacts on drinking water resources, including contamination of drinking water wells. The number of identified cases, however, was small compared to the number of hydraulically fractured wells. This isn’t to say fracking has been proven safe. The EPA’s report does indicate contamination can occur. And Sanders was correct when he followed up his comments on fracking by noting its potential impact on climate change. Clinton said that Johnson Controls, an auto parts supplier in Wisconsin, “got part of the [auto] bailout … and now they want to move headquarters to Europe.” Johnson Controls did not receive any bailout funds, although the company supported it and benefited indirectly by the government’s actions to keep U.S. auto manufacturers in business. Clinton: I am also going to go after companies like Johnson Controls in Wisconsin. They came and got part of the bailout because they were an auto parts supplier and now they want to move headquarters to Europe. They are going to have to pay an exit fee. We are going to stop this kind of job exporting and we are going to start importing and growing jobs again in our country. Clinton has added Johnson Controls to her talking points of late. In a March 1 speech, Clinton said taxpayers “helped to bail out” Johnson Controls, and now it is “turning their back on America” and moving its headquarters to Ireland. It’s true that Johnson Controls announced in late January that it will purchase Tyco International, which is based in Ireland, and the merged company will be located in Ireland. The merger will save an estimated $150 million annually in taxes. But Johnson Controls did not receive any bailout funds. On Dec. 4, 2008, Keith Wandell, the president and CEO of Johnson Controls, testified in support of the auto bailout, saying the industry’s failure would have a devastating impact on small suppliers that provide parts to Johnson Controls. Once approved by Congress, the Automotive Industry Financing Program provided nearly $80 billion to General Motors and Chrysler, including more than $400 million in loans to the two companies through the Auto Supplier Support Program, according to the special inspector general for the Troubled Asset Relief Program. The auto supplier program guaranteed auto suppliers would receive timely payments from the troubled manufacturers. Sanders promised to reduce the prison population so that by the end of his first term the U.S. will no longer have the world’s largest prison population. We can’t predict the future, but let’s put his promise into context: It would require reducing the U.S. prison population by more than 500,000 inmates in four years. Sanders: But where we are right now is having more than 2.2 million people in jail — more than any other country on earth. This is a campaign promise, at the end of my first term, we will not have more people in jail than any other country. Sanders made the same promise during the Feb. 11 debate. He’s right that there are about 2.2 million people in the U.S. who are incarcerated in state and federal prisons and local jails. That is the most of any country, according to a new report released Feb. 3 by the Institute for Criminal Policy Research in London. China is second with 1.65 million. 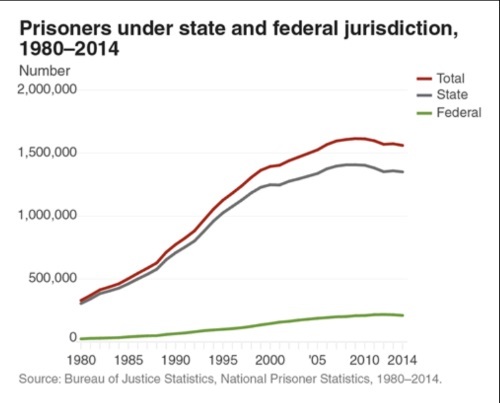 But as others have pointed out — including Vox, Slate, and U.S. News and World Report — this would be a difficult if not impossible promise to keep, in part because most prisoners in the U.S. are held in state, not federal prisons, as the chart below from the Bureau of Justice Statistics shows. Also, the total U.S. prison population — including those held in local jails — has been above 2 million since the early 2000s, as can be seen in Figure 1 of a Bureau of Justice Statistics report that plots incarceration data from 2000 through 2014. We asked Warren Gunnels, policy director of the Sanders campaign, how the senator intends on keeping that promise. He said that Sanders “will appoint a commission of criminal justice experts” to propose reforms, and he “will rely on both legislative and executive actions” to implement reforms proposed by Sanders and the commission. As we said, we cannot predict the future and leave it for voters to decide how realistic his promise is. Clinton: [L]et’s have some facts instead of some rhetoric for a change. I went to Wall Street when I was a United States senator. I told them they were wrecking the economy. I asked for a moratorium on foreclosures. Clinton, Dec. 5, 2007: Now these economic problems are certainly not all Wall Street’s fault – not by a long shot. Clinton, Dec. 5, 2007: I’m proud to represent New York, to represent the financial capital of the world. I see a lot of people who I recognize in this audience that are integral to what happens in our markets, how we create wealth, how we provide a dynamic economy that will hold out the promise of a better life for so many of our fellow citizens, but indeed for people far flung from here. And she indeed called for a voluntary moratorium on foreclosures of at least 90 days, along with a voluntary rate freeze on adjustable-rate mortgages to subprime borrowers. Sanders blamed “disastrous” trade policies for the loss of jobs in Michigan and across the country. But his claim that the North American Free Trade Agreement cost “800,000 jobs nationwide” has been disputed by studies from independent economists. Sanders: NAFTA, supported by the secretary cost, us 800,000 jobs nationwide, tens of thousands of jobs in the Midwest. Permanent normal trade relations with China cost us millions of jobs. CRS, April 16, 2015: In reality, NAFTA did not cause the huge job losses feared by the critics or the large economic gains predicted by supporters. The net overall effect of NAFTA on the U.S. economy appears to have been relatively modest, primarily because trade with Canada and Mexico accounts for a small percentage of U.S. GDP. Sanders’ 800,000 figure comes from an anti-NAFTA source, the Economic Policy Institute, which is partly funded by labor unions. He has also cited EPI’s work on the impact of establishing permanent normal trade relations with China in 2001, when China was admitted to the World Trade Organization. Recent independent studies do support the idea that the increased competition from Chinese imports led to the loss of manufacturing jobs. EPI’s work puts the number at 2.4 million “lost or displaced” manufacturing jobs from 2001 to 2013 (and more jobs beyond that in other industries). An August 2014 paper by economists primarily with the Massachusetts Institute of Technology put the net job loss because of China import competition at 2 million to 2.4 million over the 1999 to 2011 period, in both manufacturing and other industries outside of manufacturing. MarketWatch reported on that 2016 paper, whose lead author was MIT’s David Autor, earlier this year, saying that the findings ran counter to longtime economic theory on trade deals. MarketWatch, Jan. 27: The idea that free trade causes such permanent damage is generally viewed as a ridiculous proposition among mainstream economists. Economic theory has long insisted that free trade creates far more winners than losers. While that’s usually been the case historically, the rise of China has put the argument to the test. The Autor paper does say that the impact on jobs by China might fade away, as wages have risen in China, reducing the country’s advantage over other nations. An April 2015 paper by the Federal Reserve’s Justin Pierce and Yale University’s Peter Schott also found “a link” between the 18 percent drop in manufacturing jobs between March 2001 and March 2007 and the U.S. granting of PNTR status to China, though the paper does not put a number on how many were lost specifically because of trade with China. Clinton said “on average, 90 people a day are killed by gun violence in our country.” Annual gun deaths do average about 90 people a day, but only a third of those are homicides. Most gun deaths are suicides — a violent act, but not a crime, as some voters may think Clinton’s claim implied. According to the most recent figures from the Centers for Disease Control and Prevention, 63 percent, or 21,175, of the 33,636 firearm deaths in 2013 were suicides. Homicides totaled 11,208, and the rest were unintentional discharges (505), legal intervention/war (467) and undetermined (281). Clinton also repeated her inaccurate claim that the Protection of Lawful Commerce in Arms Act of 2005 “removed any accountability from the makers and the sellers” of guns. As the Congressional Research Service pointed out in a 2012 report, the legislation, which Sanders voted for and Clinton voted against, included six exceptions where civil lawsuits could still be filed, including cases in which a firearm seller acted with negligence, cases involving the transfer of a firearm with the knowledge that it would be used to commit a crime, and cases in which manufacturers and sellers marketed or sold a firearm in violation of state or federal law. Sanders claimed that “we have the highest rate of childhood poverty of almost any major country on Earth.” His campaign previously told us the senator was referring to a report from the Organisation for Economic Co-operation and Development. However, among the 38 countries listed, the U.S. ranked seventh highest in “relative childhood poverty,” behind Turkey, Israel, Mexico, Greece, Romania and Bulgaria. Sanders repeated a claim that “51 percent of African American kids today are unemployed.” That’s false. As we recently wrote, when Donald Trump made a similar claim, the official unemployment rate for blacks ages 16 to 19 in January was 25.2 percent. We also calculated, with the help of the Bureau of Labor Statistics, the rate of black youths who are unemployed and underemployed. That is, all those ages 16 to 19 who are unemployed, marginally attached to the workforce, and working part time but want full-time jobs. That rate would have been 38.8 percent in January. Clinton, Hillary. “Remarks on Wall Street on Housing Crisis.” Transcript. The American Presidency Project. 5 Dec 2007. Kinzel, Bob. “Leahy, Sanders reluctantly support auto industry rescue.” Vermont Public Radio. 11 Dec 2008. U.S. House of Representatives. “Final Vote Results for Roll Call 690.” 10 Dec 2008. 111th Congress, U.S. Senate, 1st Session. Roll Call Vote No. 5. 15 Jan 2009. 110th Congress, U.S. Senate, 2nd Session. Roll Call Vote No. 213. 1 Oct 2008. Office of the President-elect (Change.gov). “Letter from Lawrence H. Summers to congressional leaders.” 15 Jan 2009. Snavely, Brent. “Final tally: Taxpayers auto bailout loss $9.3B.” Detroit Free Press. 30 Dec 2014. “Presidential Candidate Hillary Clinton Super Tuesday Election Night Speech.” C-Span. 1 Mar 2016. Lopez, German. “Bernie Sanders just set an impossibly ambitious goal to reverse mass incarceration.” Vox. 11 Feb 2016. Neyfakh, Leon. “Sanders Is Delusional if He Thinks He Can Keep His Promise on Mass Incarceration.” Slate. 11 Feb 2016. Arrowood, Emily. “Bernie’s Prison Promise Is Too Good to Be True.” U.S. News and World Report. 12 Feb. 2016. Email from Warren Gunnels, policy director for the Sanders campaign, to FactCheck.org. 12 Feb 2016. “More than 10.35 million people are in prison around the world, new report shows.” Press release. Institute for Criminal Policy Research. 2 Feb 2016. “Table: Estimated number of persons under correctional supervision in the United States, 1980-2013.” Bureau of Justice Statistics. Undated, accessed 7 Mar 2016. Walmsley, Roy. “World Prison Population List, 11th Edition.” Institute for Criminal Policy Research. 3 Feb 2016. “Transcript of the Democratic Presidential Debate in Milwaukee.” New York Times. 11 Feb 2016. Kaeble, Danille et al. “Correctional Populations in the United States, 2014.” Bureau of Justice Statistics. Undated, accessed 7 Mar 2016. Kiely, Eugene et al. “FactChecking the Sixth Democratic Debate.” FactCheck.org. 12 Feb. 2016. Kiely, Eugene. “Trump and the Black Vote.” FactCheck.org. 24 Feb. 2016. “(Seas) Unemployment Rate – 16-19 yrs., Black or African American.” Bureau of Labor Statistics. Undated, accessed 7 Mar 2016. Roumeliotis, Greg and Bernie Woodall. “Johnson Controls to buy Ireland-based Tyco for $16.5 billion.” Reuters. 25 Jan 2016. Wandell, Keith. Statement of Keith Wandell, President and Chief Operating Officer Johnson Controls, Inc. Testimony before the Senate Banking, Housing and Urban Affairs Committee. 4 Dec 2008. “Automotive Industry Financing Program.” Department of Treasury. Undated, accessed 7 Mar 2016. Excerpts from April 2014 quarterly report. Special Inspector General Troubled Assets Relief Program. Undated, accessed 7 Mar 2016. “Johnson Controls stands by its record — Company never took auto bailout funds.” Press release. Johnson Controls. Undated, accessed 7 Mar 2016. EPA. “EPA’s Study of Hydraulic Fracturing for Oil and Gas and Its Potential Impact on Drinking Water Resources.” Accessed 6 Mar 2016. Levitan, Dave. “Clearing Up Claims on EPA Fracking Study.” FactCheck.org. 5 Jun 2015. EPA. “Assessment of the Potential Impacts of Hydraulic Fracturing for Oil and Gas on Drinking Water Resources: Executive Summary.” Jun 2015. Reuters. “Fracking can cause nearby abandoned wells to leak methane – study.” 20 Oct 2015. EPA. “Overview of Greenhouse Gases: Methane Emissions.” Accessed 6 Mar 2016. Jackson, Brooks. “NAFTA’s Impact on Employment.” FactCheck.org. 7 Jul 2008. Villarreal, M. Angeles and Fergusson, Ian F. “The North American Free Trade Agreement (NAFTA).” Congressional Research Service. 16 Apr 2015. Faux, Jeff. “NAFTA, Twenty Years After: A Disaster.” Economic Policy Institute. 3 Jan 2014. Economic Policy Institute. “About.” Accessed 6 Mar 2016. Kimball, Will and Scott, Robert E. “China Trade, Outsourcing and Jobs.” Economic Policy Institute. 11 Dec 2014. Acemoglu, Daron et al. “Import Competition and the Great U.S. Employment Sag of the 2000s.” Working paper. Aug 2014. Autor, David H. et al. “The China Shock: Learning from Labor Market Adjustment to Large Changes in Trade.” Working paper. Feb 2016. Bartash, Jeffry. “Free trade with China really did devastate millions of Americans.” MarketWatch. 27 Jan 2016. Pierce, Justin R. and Schott, Peter K. “The Surprisingly Swift Decline of U.S. Manufacturing Employment.” American Economic Review (Forthcoming). Apr 2015.